The preliminary results reveal that Merkel’s allies are set for their worst election results since 1950. The Christian Social Union (CSU) has won 37.3 percent of the vote and has lost its absolute majority for only the second time since 1962. This bad result for Chancellor Merkel’s party could increase tensions within Germany’s fragile government. The Bavarian premier Markus Soeder said: “Of course today is not an easy day for the CSU. We did not achieve a good result. We accept the result with humility”. The Greens have recorded strong gains and are the second largest party in the Bavaria vote with 17.8 percent of the vote. The far-right Alternative for Germany party (AfD) are set to enter the Bavarian Regional Assembly for the first time with 11 percent of the vote. The centre-left Social Democrats (SPD) are expected to win 10 percent of the vote. The Christian Social Union (CSU) is expected to win around 34 percent of the vote and is set to lose the absolute majority for the first time since the end of the war. 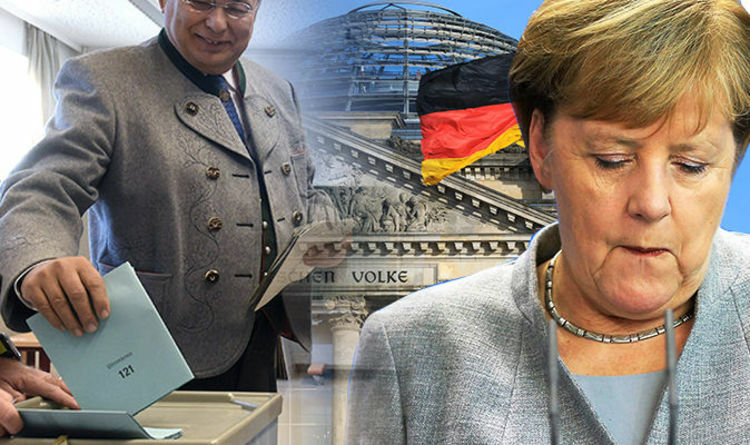 Political scientist at the University of Passau, Michael Weigl, has said that personal attacks on Angela Merkel by leader of the CSU Horst Seehofer are to blame for CSU’s weak result. Mr Weigl said: “This created a political climate of polarisation from which the Greens and the AfD benefited the most, with their clear stances on immigration. Three in four voters who have abandoned the CSU in Bavaria have said they think the party has focussed too much on immigration and has neglected other issues. Mr Seehofer has been highly critical of Merkel’s immigration policies toward migrants and has excluded her from election campaigning. Initial figures show that more voters have left the CSU for the Greens than for either the AfD of the Free Voters. SPD national chairwoman Andrea Nahles said: “Congratulation to the Greens, who were the true winners of the election. Ms Nahles said the “poor performance” of the federal government in Berlin was one of the reasons for her party’s weak showing in Bavaria. The Bavarian election comes a day after a mass protest in Berlin on Saturday where 240,000 people demonstrated against racism, xenophobia and the rise of the far right. In Berlin, the CSU is one of three parties in Merkel’s federal coalition government along with the Christian Democratic Union and the Social Democrats. Regional Green co-leader Katharina Schulze says people are fed up with the politics of “hate and agitation” and “want a policy that gives courage instead of fear”. Chancellor Merkel, who has been in power since 2005, has already been weakened this year by government infighting. After the CSU has held power in Bavaria for so long and needing a coalition partner would be a humiliating setback for the party. Bavaria has 13 million residents and is the biggest by area of Germany’s 16 federal states. The Christian Democratic Union will hold its annual congress in December when Merkel will seek re-election as a party chairwoman.